Different investment styles (such as value, growth, large cap, small cap) are suited to different stages of the investment cycle but it is often difficult to know ahead of time which one will perform best. Pioneering academic research by Eugene Fama and Kenneth French, both professors at the University of Chicago, found that value stocks and small cap stocks outperform the equity market on a regular basis. However, they were quick to point out that, while over the long-term value beats growth and small cap beats large cap, investors must be able to ride out the extra short-term volatility and periodic underperformance that can occur in a given short-term time frame. Research shows that these two dimensions (value and small market capitalization) proxy for stock risk characteristics that do not seem to be captured by beta. Academics generally agree that over the long-term value stocks and small-cap stocks earn significantly higher returns than are predicted by their risk profiles. Hence, it might be assumed that a straightforward strategy for long-horizon investors would be to buy diversified small cap and value exposures (either through managed funds, SMAs or ETFs) and hold on to them over the long term. However, in a more recent research paper written by Cambridge Professor Raghavendra Rau for the DWS Global Financial Institute, Investment Styles and Their Performances in Different Market Cycles, a useful addition to the analysis has been made to discover the most opportune times to overweight value or small caps in an equity portfolio. Professor Rau investigated how stable these two anomalies are over different stages of the business cycle, using a sample of US equity mutual funds over a long period of time. A stable relationship would show that investors need not pay attention to the business cycle when deciding which types of funds to invest in – as an unconditional investment in small cap or value funds will then always earn significantly higher risk-adjusted returns than investing in large cap or growth funds. By contrast, a time-varying relationship would show that investors might be better off tactically shifting from growth to value or large cap to small cap during economic expansions or contractions. He found that consistent with conventional wisdom; value funds typically do earn higher returns than growth funds over the course of the business cycle, and that small cap funds earn higher returns than large-cap funds. 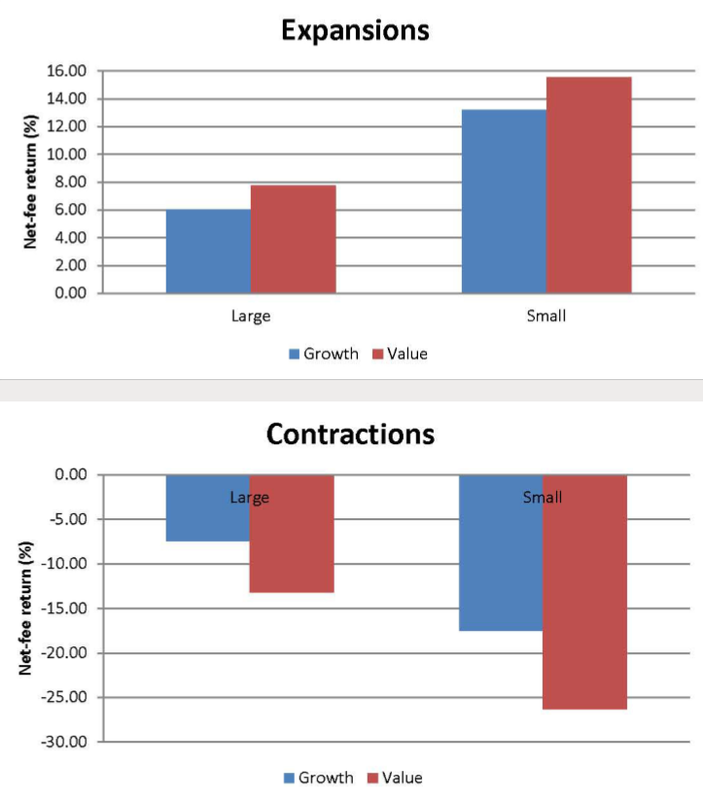 However, this pattern changes during economic contractions, when large cap and growth funds earn significantly less negative returns than value funds and small cap funds (see above chart). Because expansions typically last longer than contractions, if one were to favour a passive holding strategy, a portfolio consisting only of small-cap and value funds would deliver higher returns over the long term. If investors expect that an economic contraction is coming, they would do better to switch out of value into growth and out of small caps into large caps, with a view to switching back again later during the expansionary phase. However, the effectiveness of shifting strategies is dependent on the speed of execution. Ideally, to generate higher returns than a passive benchmark, a strategy shift needs to be executed within one quarter of the contraction’s occurrence. A lag time greater than one quarter significantly diminishes the value of switching strategies. In the current market context of the US economic expansion accelerating one would expect, based on the above analysis, that value and small caps should be outperforming. That is exactly what is happening, as can be seen in the charts below. 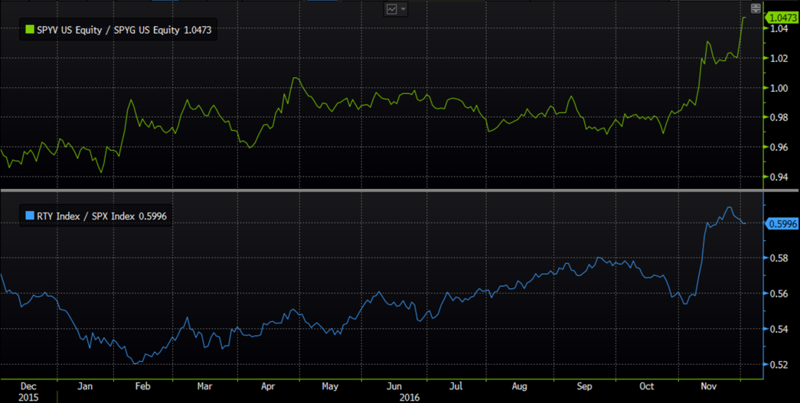 The first panel shows the relative performance of the S&P 500 Value ETF (SPYV) over the S&P 500 Growth ETF (SPYG). The second panel shows the relative performance of the Russell 2000 small cap Index (RTY) over the S&P 500 index (SPX). Currently small is beautiful, and value is in style. That trend looks set to continue until the market believes the current economic expansion is ending.